When the CME announced that the exchange was considering leaving Chicago because of the recently imposed Illinois tax increase, it was disappointing to hear the tepid response of Chicagoans. Sure, you had knee-jerk reactionaries claiming that the CME wasn't paying its "fair share" (sadly, coming from the educators of our children), even though the exchange pays one of the highest, if not the highest, effective tax rates of all IL corporations. But moreover, the news was met with indifference — just another corporation looking for a handout from the government. We tend to underestimate the economic engine that the exchange and investment community provide, and assume the static view — it was here before me, and it will remain so. When something is so woven into the fabric of a culture, it is hard to recognize and envision the magnitude of its absence. It is this way with Chicago and the exchanges. Nothing is ever static, and a brief look into our history provides an interesting perspective. Louisville, New Orleans, Detroit. These cities do not come to mind when asked to name financial centers in the United States. However, each of these cities had at one time been host to a US stock exchange and a burgeoning brokerage and investment industry dependent on that exchange. 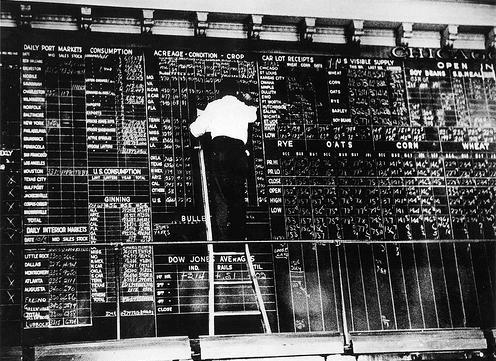 The table below lists cities that were once home to stock exchanges. "Once" being the operative word, as it would be difficult to name any of these as a financial center any longer. For reasons including economic factors, competitive forces and regulatory burdens, they either closed or merged with stronger competitors. When these exchanges closed, the individuals who made their living from their operations moved to one of the remaining financial centers or found new lines of work. Once the talent left, the industry dried up. It would not return. In that trading is a unique skill set, requiring mathematical aptitude, an understanding of several modes of economics, and risk management, most traders learned these skills from a more experienced senior trader in an apprentice/mentor-like relationship. Once an existing generation of investment professionals is gone, there is no one to train the following generation. The process does not take long. When the Pacific Exchange (PCX) merged with NYSE ARCA in 2006, it signaled the end for a significant percentage of participants at the San Francisco-based equity and options exchange. A friend of mine who is a partner at a securities firm in the area remarked that the presence of a local exchange supported the local investment industry, and its absence has led to a decrease in activity and an ensuing shallow talent pool today. If we consider opportunity costs, the cities that lost their investment industry once their exchange closed incurred significant opportunity costs. Those cities would no longer be the beneficiaries of increased demand for successful new contract launches. The CME's introduction of financial futures revolutionized the world's risk management capabilities and the CBOE's launch of the S&P 500 and Volatility indexes have been innovative and hugely successful financial instruments. In addition, those cities do not benefit from the growth of ancillary industries around the investment community. Large portions of Chicago's law, technology and consulting industries focus on the financial sector, and all benefit from the innovations of the Chicago exchanges. Chicago's law industry benefits from the development of intellectual capital, tax, contract and arbitration practices because of the demand for such services. The exchanges and investment houses provide a steady supply of that work. Similarly, Chicago's consulting firms benefit from the development of their regulatory and compliance advisory practices. Having been successful in building their practice in these areas, are they not better able to serve other clients in other industries? If the exchanges did not exist, there would be no reason for firms to develop these capabilities, and this expertise and knowledge base would simply not be found within Chicago's law and consulting industry. The development of new core competencies enables firms to grow and progress to be achieved. The opposite of growth and progress, decay and regression, are the result of disincentivising drivers of innovation. Chicago prides itself as a global city. However, our standing as a global city has as much to do with the quality of our capital markets as it does our transportation networks, cultural offerings, and educational institutions. The innovations of the Chicago exchange community and the expertise of the investment community have positioned Chicago as the risk management capital of the world. Risk management services are in high demand and will continue to be in the future. Given the recent market history, it should be noted that during the market crash in 2008, when credit markets seized up and counterparty risk blew spreads wide, the Chicago markets did not close for a second and provided needed liquidity to investors. This is a testament to the proficiency and value of the Chicago exchange and trading community. This expertise was developed in Chicago, but the next evolution in the markets could take place elsewhere. If exchanges leave the city, the chances of this happening increase by an order of magnitude. As history shows, once an exchange closes or is acquired, the decline of the host city's investment industry is not far behind. It would be foolish to think that Illinois can balance the enjoyment of benefits from this dynamic economic engine while pursuing shortsighted policies that threaten its continuation. On this, there are two trends that deserve attention. The first trend is that we have entered an era of exchange consolidation. This is not a new phenomenon; we have seen it throughout the history of US markets. The Depression-era closures, the post-war consolidations, and economic stagnation of the 1970s again led to closures. However, the scope of this new era is global. The New York Stock Exchange and Euronext are merging into one company. The London Stock Exchange attempted to acquire the Toronto Stock Exchange, and the Singapore Derivatives Exchange also tried to merge with the Australian Stock Exchange (both deals have fallen apart on regulatory concerns). If the CME (or any other Chicago exchange) were to acquire or merge with another exchange, it would be almost guaranteed that upon cost analysis, it would be more cost effective to move operations outside of Illinois. The exchange partnerships that emerge from this era will be the dominant exchanges in the future. Since Chicago is such a beneficiary of the existence of the exchange and investment community, shouldn't it pursue policies that help position the industry for competitiveness rather than policies that threaten it? Why should our politicians put at risk the balance sheets required to compete at this level? The second trend is the transition from open outcry markets to electronic markets. Electronic trading has largely transformed exchanges into technology companies, where the requirement of a physical and centralized location for buyers and sellers to meet is now obsolete. The electronic market can be located anywhere and accessed from any point in the world. This has generated a shift in thinking among the exchanges and trading firms. It has allowed local tax policy to move from being a fixed cost of business to a conditional cost of business. Where it was once necessary to be located in Chicago and be subject to city and state taxes, a firm can now relocate to a low-tax state and keep its trading systems collocated at the exchange data center. In short, Illinois enjoys a newfound elasticity in the demand for its tax environment. This change is not unnoticed. Illinois has become one of the least favorable states in the US for business, going from 8th to 48th since 2006. Its tax policy is encouraging the investment industry to pull up roots and leave. Given that the CME Group is a publicly traded company, its executives have a fiduciary duty to the shareholders explore relocation options. Politicians enjoy positioning themselves as investors -- making wise choices with the public finances -- so it is easy to see how politicians think raising taxes on "x" will result in a net positive in revenue, and believe that they are acting in a fiscally responsible manner (static view). However, the simple linear equation does not account for the risk that an increase on "x" may cause the increased revenue to be offset by decreased economic activity (and decreased tax revenue) of firms whose income is directly related to "x" (dynamic view). The risk profile is that the value of the increased revenue from the tax increase is higher than the risk of decreased economic activity from firms who rely on "x." This is a risky investment strategy, as the gains are slight while the potential loss is significantly greater. Perhaps this is why politicians have such a poor track record of investing. Critical to the understanding of the issue is that the trends are larger than the Chicago investment industry, and are largely immune to the whims of local governments. The markets will decide where capital is rewarded best. Whereas the state and local government could foster growth-oriented economic policies that enable Chicago to maintain its standing in the global financial community and sustain the benefits of having a dynamic and local economic engine within its region, its leaders pursue policies that put it all at risk. There are few hedges if this trade goes bad. As a CBOT member, I want to thank you. The city and state do not appreciate the economic benefits that the exchange provides. I was a little jaded about the CME's threat because I figured they would be able to extract a rebate from the state. CHICAGO Merc. CHICAGO BOT. They're not going anywhere, at least not the trading floors. Losing the CMEGroup would devastate the economy of Chicago and Illinois. More people in the industry and it's ancillary beneficiaries need to speak up for the CMEGroup and it's linchpin role in Chicago, Cook County and Illinois' economy. I do think that the CME needs to move from Chicago. The city has become ungovernable and its infrastructure is terrible - for the second time in less than three weeks, this week, the electricity went out for tens of thousands of homes and it has still not been completely restored across the Greater Chicago area. That is symptomatic of a third world location, not of a "global city." And, the CME would not be the first "Chicago" entity to leave the city if it did leave. The Chicago Bridge and Iron company relocated to Houston a long time ago, and, Motorola and Sears are looking at moving out of the Chicago suburbs and out of Illinois altogether. In the end, emotion counts for nothing - the CME owes its shareholders the maximum profits that it can offer. If this means having to relocate to a state that is more favorable from a tax stand-point, then the CME should be ready to move. That, after all, is capitalism. It is also honesty. Staying on at a location that does not offer the best returns to members, clients and investors is dishonest when it is a business that takes such a step. The CME needs to develop a spine and move - the sooner, the better. There is no room for emotion here. If the City of Chicago and Cook COunty (and the State of Illinois by extension) cannot appreciate the money that the CME brings to the city, county and state, then the CME needs to look at moving elsewhere and maximizing the returns to everyone who earns from doing business through it. Peter Huff articulates the value and contributions of Chicago area exchanges quite well in his article Risky Strategy: Why Chicago Needs the CME & CBOE. As a lifelong Chicagoan and an exchange member myself, I appreciate the immense impact Chicago exchange’s have had on our city over their 163 year history. Today, the CME Group is the largest and most diverse derivative marketplace in the world. Its executives do not appear to be comfortable remaining static in its industry leadership however. Partnerships with many exchanges around the world have built this local exchange into a world power house. The CME Group further continues to be one of Chicago’s leading technology innovators also. It recently opened a massive new datacenter in the Chicago area to provide for current and future collocation demands of its expanding domestic and international customer base. All of this translates into jobs and opportunity for Illinois residents. Illinois and the City of Chicago have seen a decline in population and job opportunities for quite some time now. States with less onerous tax and regulatory environments, such as Texas and Indiana, have benefited from our local and state political leader’s loss of vision and integrity. The CME Group and other Chicago exchanges have persevered in spite of this clouded business climate in providing opportunities and employment to our area.